Lytha.com - "Lytha way" - Escape! General Remarks about "Escape" in the "Lytha Way"
Welcome on the final frontier for the "Lytha way". It is possible to play this mission without dealing any damages, even without using gas arrows or gas mines on the enemies, but it is a highly timeexpensive, tricky, scary, and sometimes also annoying adventure. 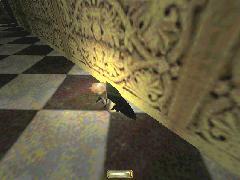 Escape is even more difficult than the Thieves' Guild - and if you have played that mission in the "Lytha way", you know how difficult that is. So, if you want to give it a try, then make sure that you have an entire day for disposal, without any duties or distractions. There are more than enough tricky situations in this mission. The following are just examples. In the tunnels, most of the really nasty situations can be handled by sneaking in as far as possible, getting seen somewhen, performing a mad run to the item or loot, grabbing it, performing a mad run to one of the few really safe places. Really safe places are: The half-high cave N of the entrance to the tunnels (climb up to the higher level with a rope arrow! ), the treehouses. 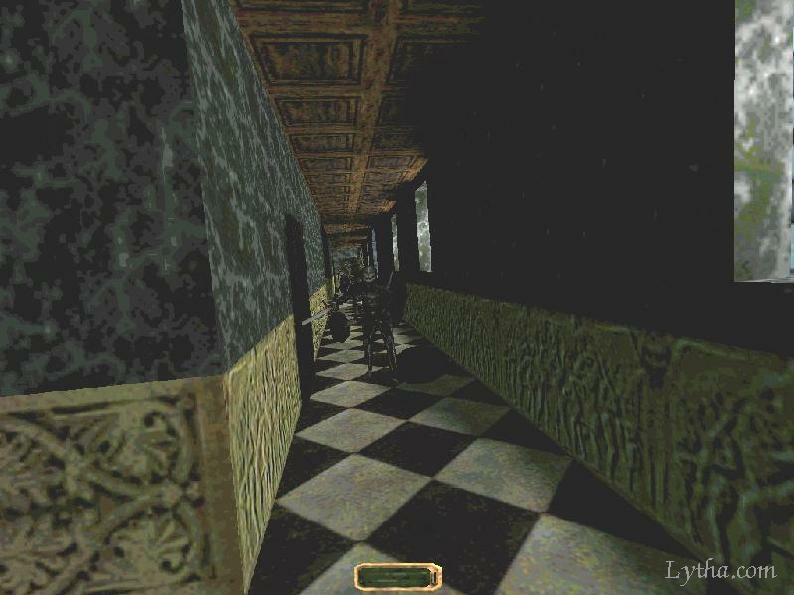 Not really safe places are: Shadows here and there that are out of the patrol way of the enemies, shadowy caves where the enemies can enter, the shadows in the room that leads to the more 'civilized' parts of the basement. 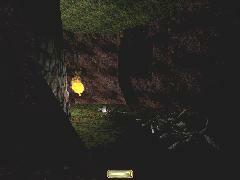 As long as you are in the tunnels, the half-high cave N of the entrance to the tunnels will be your best friend. The treehouse where you can mantle in will also be a good friend. There are two Spiders' Caves in the tunnels - one N and one S from the entrance. 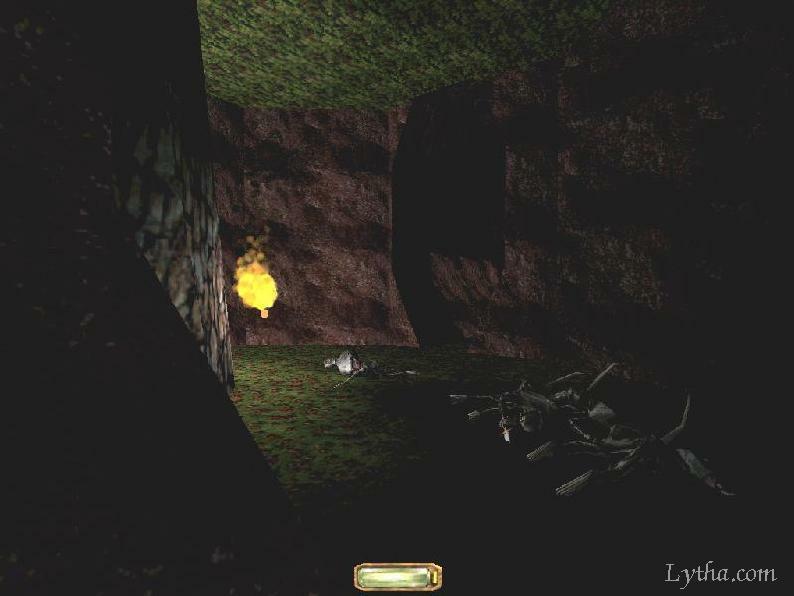 In these caves are not only stationary Spiders and Spiders on patrol, but also several goodies (like precious water arrows) and several items of loot. Because that is not fun enough, the caves are structured in a very maze-like fashion. The entrance to each of these caves is a relatively secure area (as the ledge that leads to a treehouse in the S caves, and the shadows in the grey tunnel in the N caves). Wait there, and study the patrol patterns of the Spiders that you can see from here. 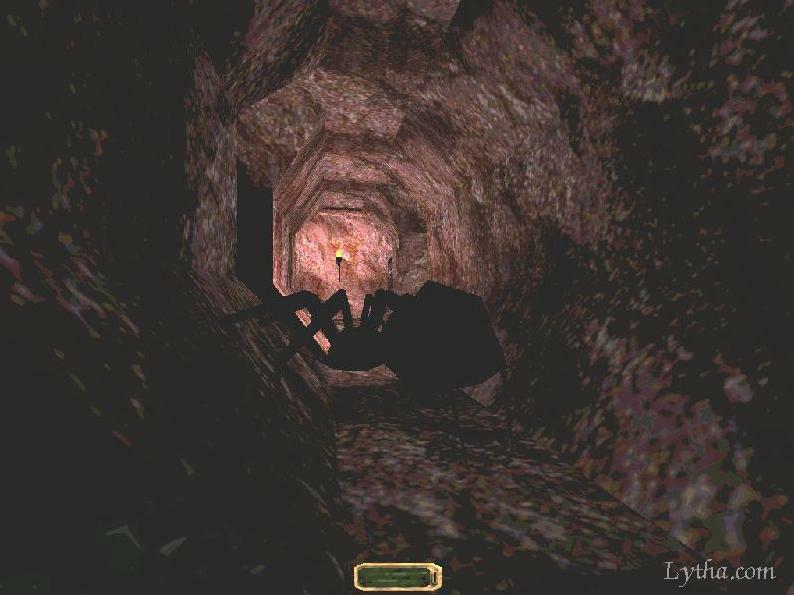 Then trail the Spiders, and if you are lucky, you can reach another tunnel before it turns back. The caves of most of the stationary Spiders are lightened only by a torch, or by nothing - if you don't make too much noises, you can sneak past the Spider. The problem is that it will most probably notice you when you leave. Whenever it can't be avoided (that is, whenever a Spider has noticed you), try not to break into panic, but run to the items, grab them, and leave again. The Spiders won't follow you into higher positions. Or - arachnophobiac unite! 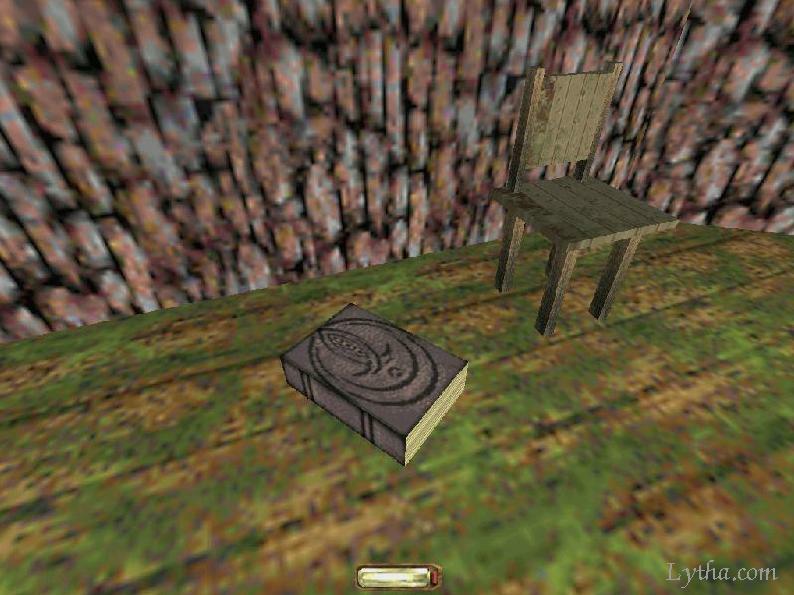 - you train your sniping skills here. Every Spider can be killed with just one shot. The Information is in the single treehouse in the N Spiders' caves. It is guarded by 2 Frogs, 2 Bugbeasts, and the direct way to the treehouse is guarded by 2 Spiders. 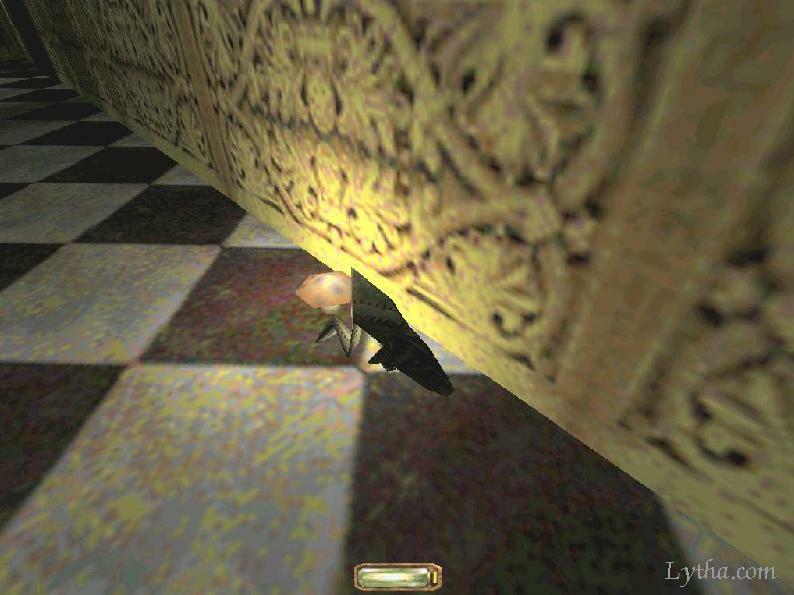 You can sneak past the Spiders without alerting them. That means, you have the shadow in the entrance to the cave with the treehouse for yourself without the fear that a Spider will bite you in your back. Shoot a rope arrow into the treehouse, so that you can climb up. Then, when the Bugbeasts are not too close to the rope arrow, run in, climb up, mantle up, and run into the treehouse. If you were fast enough, neither the Frogs will explode at your feet, nor will the Bugclouds hit you. Getting out is a different, more painful experience. Slide down both as quickly as possible plus not alerting everyone plus without recieving too many damages, and head as directly to the exit as possible. Sounds like fun? Agreed. - However, the insects will most surely notice you on your way out, so run, just ignore the Spiders, and head directly to the half-high cave N of the entrance. 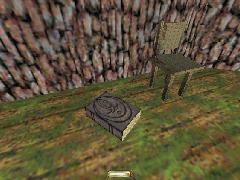 Climb up your rope arrow to the 2nd floor, and then have some tea until the commotion ended. You could also douze the torches in the cave with the treehouse, but I don't recommend that. There are worse areas where you will need the water arrows more urgently. The main entrance of the former Mansion is now inhabited by about 3 Apebeasts, 2 Bugbeasts, 5 Frogs. They are not only between you and the exit, but they are also guarding a piece of loot in the tower E of the main entrance. Well, if you are a purist, then you need to create some distraction now. It helps to get the attention of everyone, and to run back trough the bar and the dining room with all of them chasing you. This gives you a few seconds to reach the tower E of the main entrance, and to get the gem. If you don't mind using gas arrows and gas mines, this area is made for you. Try to get as many enemies with each gas utensil as possible. Sadly, Escape does not allow much roofclimbing. 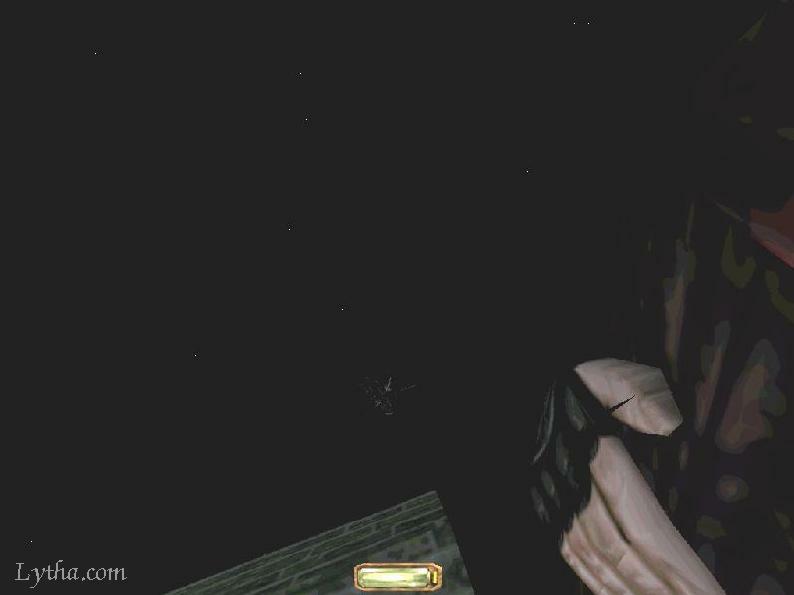 The roof of the Mansion and the outer streets are the same as in the Sword, but to reach them, it is necessary to play in Expert difficulty and not to get the informations about The Eye before the roof-climbing procedure. But there are also other ways to have fun. 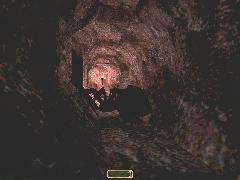 A good way not only to have some fun, but also to make life easier in the tunnels is to alert the Fireelementals. Once they are alerted, they hurt everyone who comes too close - and the Apes and Bugbeasts definitely come too close. It may take a while, but after a while the Fireelemental on patrol will have eliminated not only the Apes and the Bugbeast between the two treehouses, but also the single Ape who patrols between the left treehouse and the entrance to the 'more civilized' parts of the basement. A problem is of course that the Fireelementals are now much easier to alert, and so you need all your stealth and skill to avoid them. I did not yet bother enough to try to knock a Frog out with the blackjack. Theoretically, he should also recieve 1 damage then, loose his only hitpoint, and blow up. But, I have tried this in the dromed, with a happily jumping Frog. He did not explode. This means: Either the Frogs have - despite what EvilSpirit and other developers told us - more than 1 hitpoint. Or, the Frogs don't recieve a damage when whacked with the blackjack, just as the Air- and Watermages. And, here we have the ultimative area for "The Scientific Project: Apes in Space".